In the last few days, a very loud discussion has been taking place regarding the legitimacy of an anonymous 4chan and 8chan poster known as "Q." 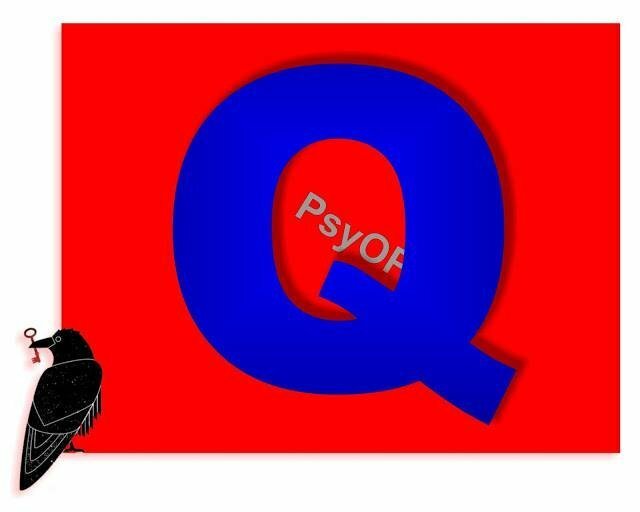 My singular goal in this Steemit-only opinion piece is to explain why, despite the ensuing public backlash, I have felt motivated as an independent journalist to express skepticism regarding the Q persona. This article is not intended to demand readers agree with me, or tell readers what to think, to disparage those who cover Q on social media or those I've already disagreed with respectfully on Twitter. This piece is simply and only intended to explain why I have spoken out repeatedly against the credibility of this Chan-based persona. It's also not intended to speak for anyone except myself. I will give a very condensed overview of the context of the latest discussion on Q that has occurred in the last few days. 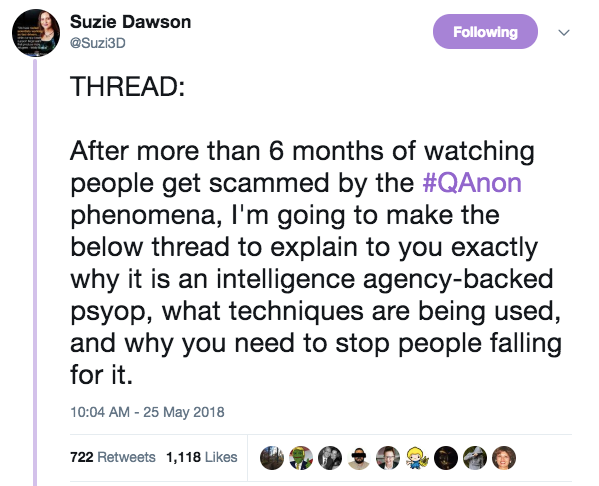 First, independent journalist and activist Suzie Dawson wrote a very long, precise and methodical twitter thread on the ways in which Q's posts fit the characteristics of a standard cointelpro type operation. I recommend all readers to view that thread in full, as provided by the ReaderUnrollApp before continuing with this article. 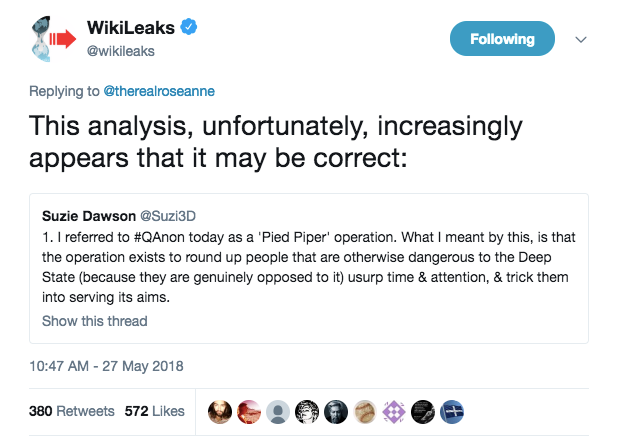 After Wikileaks' tweet and the wide circulation of Suzie Dawson's thread, Caitlin Johnstone wrote via Medium about the fact that the official Wikileaks Twitter account had acknowledged the likelihood that the Q anon persona is being used as a pied piper figure for Trump's base. 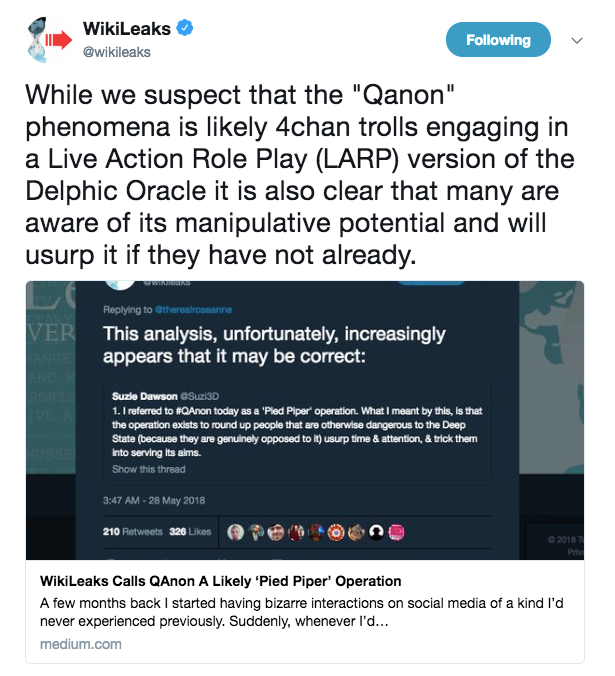 The Wikileaks Twitter account then tweeted Johnstone's medium post, adding that: "While we suspect that the "Qanon" phenomena is likely 4chan trolls engaging in a Live Action Role Play (LARP) version of the Delphic Oracle it is also clear that many are aware of its manipulative potential and will usurp it if they have not already." 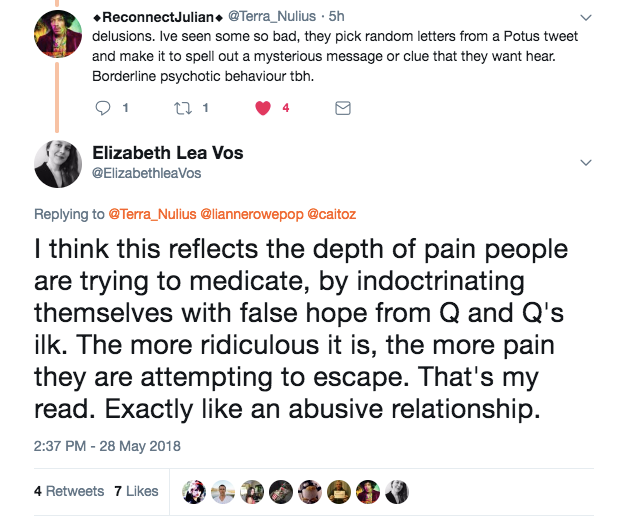 Interestingly, though it was Suzie Dawson who pushed the hardest against the Qanon persona, Caitlin Johnstone received the brunt of the backlash that ensued, possibly due to Dawson having fewer followers of the MAGA persuasion than either Johnstone or myself. I entered the fray today, a couple of days after Suzie's thread and after Wikileaks' statements / tweets regarding Q. No one pays Suzie Dawson, Caitlin Johnstone, or myself to speak the truth as we see it outside our own audiences. Independent journalists survive on patreon donations, subscriptions and the like. Because of this, it is financially against our interests to tell the truth about Q as we see it, and risk losing readers' support. 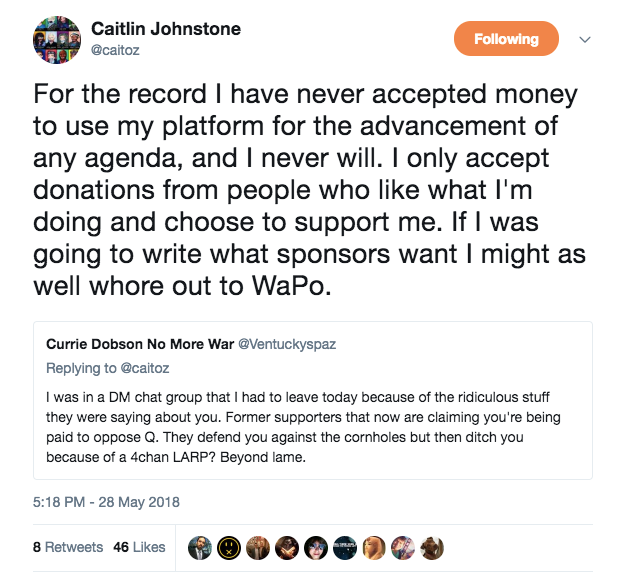 As Caitlin wrote, if she - or any of us - wanted to be paid shills we could have had a much easier time of it by applying for a job at CNN. We didn't. So what does this mean - that independent journalists would risk losing support to tell the inconvenient and painful truth as they see it? It means that we value honesty more than popularity or money. It means we believe in a healthy skepticism and not following false narratives because they are convenient or because a lot of our supporters might follow those narratives. We speak out anyway because if we were in this to make money we never would have started writing about inconvenient truths. When we criticize Q, we are literally going against financial interests (unlike corporate press when it shills for cash) because we risk losing support from those who disagree with us. What motivates independent journalists to apply healthy skepticism to Q is precisely the fact that we have poured our time, energy and life-blood into reporting with integrity. We gave up endless hours of our lives to the pursuit of honesty in the face of criticism from all sides, censorship, attacks of all varieties. Caitlin Johnstone specifically has been baselessly smeared numerous times by the cancerous quarter of the neoliberal left because she dared speak against war consistently: and now the right wing has joined in on attacking her credibility because they do not like her opinion. While these experiences pale in comparison with the risks taken by organizations like Wikileaks, or by whistleblowers like Snowden and Manning, It quite honestly pains this writer to see so many well-intentioned Q followers parroting disastrously inaccurate information and attacking those who have given up huge amounts of time and energy and often money as well specifically in the name of accurate reporting with integrity. 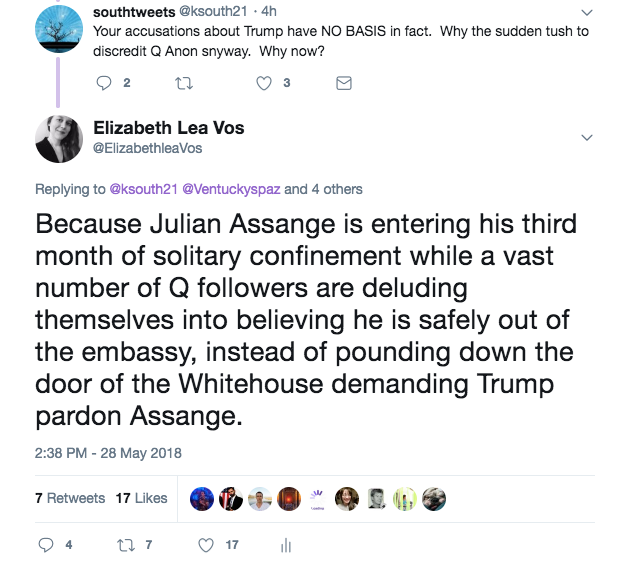 Caitlin, Suzie, and Wikileaks already outlined extremely sensible reasons to approach Q with skepticism. To that, I add the obvious -- that any persona arising from 4chan and 8chan requires a very healthy dose of skepticism. To trust any anonymous poster on 4chan over Wikileaks is a sad commentary on the state of the American public. My personal take on the issue is that whether Q is a "larp" or a psyop, the narratives spread by the persona have dangerously persuaded a large portion of the conservative base into the belief that all is well and a plan is in place: A "Storm is coming." "[In February 2010], US initiates WikiLeaks investigation, over a dozen federal government agencies involved, including the FBI, DoJ (who are now leading the investigation), with support of NSA and CIA and others." In other words, the Trump Administration absolutely has the power to remove the impetus for Assange's extradition and imprisonment in the US, which Adam Schiff recently admitted is the assumed goal of the US government at this time. Trump's base is the only segment of the population with a chance of persuading the President on policy matters. It is imperative that they relentlessly push Trump to grant Assange a preemptive pardon. Through Q, that population is being co-opted into complacency at the most critical moment in the long history of persecution of Julian Assange and Wikileaks for their incredibly effective brand of scientific journalism. In addition to the damaging effect Q is having on support for Julian Assange, not to mention other whistleblowers like Edward Snowden ( a matter Suzie Dawson covered in depth), the persona is also acting to poison independent media and co-opt the segment of the public that is genuinely anti-establishment. By hiding the lies within exhortations to research, the persona builds enough plausible deniability to manipulate masses of well-intentioned people who do not wish any harm to Assange or Wikileaks, and are in fact interested in truthful reporting. Additionally, many Q followers I have interacted with over the last 24 hours have expressed an appalling lack of awareness regarding a number of actions by Trump and his administration. A few include the statements made by Trump's Attorney General, Jeff Sessions, to the effect that the arrest of Assange is a top priority for Trump's Department of Justice. Secondly, the words of former CIA Director Mike Pompeo (now Trump's Secretary of State), comparing Wikileaks to terrorist organizations like Al Qaeda. Another extremely alarming act by Trump was the nomination of Gina Haspel to the position of CIA Director, despite her role in torture programs that are absolutely illegal under international law. In my opinion, this is why many readers of Disobedient Media or Caitlin Johnstone's content are now inflamed when we express criticism towards Q. The persona has actively targeted anti-establishment segments of the population. To control that thought, it is necessary to co-opt the thought from within, in addition to separate efforts to censor legitimate independent voices. As Suzie Dawson wrote, the first necessary stage of any psyop is to establish credibility. Q has been extremely successful in that effort. 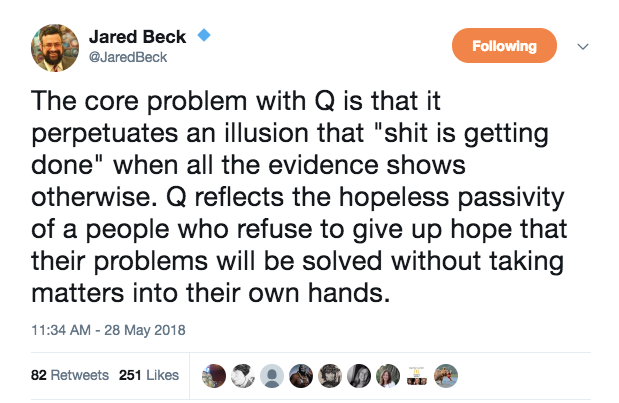 I see Q not only as a danger to the effectiveness of support for Assange among conservatives, but also as an indicator for the depth of pain Americans are experiencing, and a demonstration of the lengths they are willing to go to to find hope and any remedy for their suffering. It is doubly infuriating that anyone would manipulate a group of people desperately looking for reason to hope. In other words: reality is painful, and deeply so. It is easier to accept a comfortable lie, whether it is told on an image board or anywhere else, than it is to face the painful reality that we live in. However, until we collectively face that same reality and are brave enough to accept the resulting pain, nothing will ever change. Disobedient Media had not yet been founded during he 2016 election cycle and the immediate post-election aftermath. At this time, I had many fellow Bernie supporters tell me to stop criticizing Hillary Clinton, to shut up and get in line to support the 'lesser of two evils.' I refused to shut my mouth and go along, which sacrificed my relationships with friends, family, and my local community. Some of those relationships have only just begun to recover, and some never will. If I had wanted to win a popularity contest, I never would have stood my ground on that issue. The public shaming that occurred simply for continuing to criticize the abject corruption of Hillary Clinton contributed to my decision to become an independent journalist. It was a deeply UN-popular opinion that motivated me to raise my voice louder. Likewise, I will not shut my mouth now and go along with a narrative I see as harmful and based on manipulation because I hold an unpopular opinion. I am not going to be shamed into silence. The only thing I stand to "gain" by saying all of this, is most likely the loss of a large number of followers, subscribers and the rest. I wonder if I can dump photos on the blockchain? Because I knew Q was a psyop from the start since I was asked to join it in January when I was sick. The person literally told me I would be paid if I helped the psyop and it was to "excite the base." I am choosing to redact the DM with the person for the time being because they weren't one of the main people involved in Q and were just a middleman. Q DM communications photo dump..
Somebody is lying here... That much is for sure. I wrote a piece about Q a week ago. I simply asked what the end game was. I think it's become clear over the past week - that the end game is the extradition of Assange while Trump's base is "trusting the plan" I have no doubt that Trump's election was an unforeseen hiccup for the Deep State and his base's awareness and anger was disconcerting. IT appears that Q has neutralised the base and Trump has been coopted long ago. I also was touching on the subject of the #QAnon phenomena a week ago as Nathan from Lift the Veil was highlighting it. A lot of people waking up to the deception now. Glad to see it as well all need to be putting our energy where it really matters. Agreed 100% an all these points. Link your piece on Q if you want, I'd like to read it! they don't care who wins the election show. neither should we. you lobby/protest whatever useful idiot is put "in charge"
It really is. And I guess it's good that despite the backlash some of us are calling it as we see it. How is it possible the Q-crazies are still in abundance & haven't stopped? The way I see it, they're doing me a favor by unfollowing me if their feelings are hurt when I say Q isn't real. I've also been stating that the whole Q & Trump 4D Chess thing has been one big Psy-Op for a while now. One needn't look further than Trump's appointments of Neo-cons, banksters, and Deep State operatives like Pompeo, Bolton, Gina Haskel, and the like. Also, why aren't any of the Trump supporters, or anyone else for that matter, covering the Fed's dirty Exchange Stabilization Fund's interventions in all markets? The real test, in my (and Bill Holter's opinion) is if we don't start seeing some arrests and perp walks of those big names (what's the latest count on those sealed fantasy indictments by now, 500,000?) 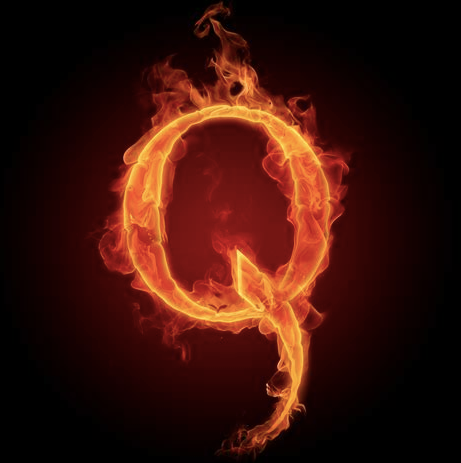 by some time in July just prior to the mid-term elections (as time would be needed to expose and sway things in Qs/Trumps favor) then we will surely have confirmation that this whole Q thing was one big Psy-Op. The theory that Trump has been in place for dividing the country and getting Iran holds water; just look at the reality on the ground. And guys, really, one simple basic question: why the hell would you put your hope and faith in an unknown / anonymous person for something as paramount as a nation's future? Have followed you and will check out your work. Skepticism is always healthy. "And guys, really, one simple basic question: why the hell would you put your hope and faith in an unknown / anonymous person for something as paramount as a nation's future?" Great post thank you ! i have writte some articles to say the same thing and i have also being attacked for that .. Thank you! Followed you and will check them out. Great analysis, thanks for giving the exposure it deserves! AWESOME! I resonate with everything you said! In the world wide independent journalism is really important for independence of people. You wrote a good article. I think this article is help to know about independent journalism and the "Q" Persona. Congratulation elizbethleavos! Your post has appeared on the hot page after 60min with 22 votes. I remember checking in on some of the first Q postings. He predicted a few verifiable things, like that Bill Clinton was incredibly sick and wouldn't survive 2016. After all those predictions failed to materialize I figured Q was fake and stopped paying attention. I think the analysis is spot on. Q has effectively pulled a "Pace and Lead" where he's/they're/it's pulling some of the more active Trump supporters into a bunch of evil pro-Deep State positions. The "trust the plan" idea worm is insidious and damaging to some of the people who are most potentially helpful in the war against the Deep State. Something to look for in the wake of Q's popularity declining as a result of these analyses is for "conservative" celebrities to come out and start shilling for Q. We're already seeing it from Roseanne Barr. Obviously there's no way of telling whether she's a willing dupe or a useful idiot, but the longer she stays visibly pro-Q, the higher chance it's the former.
" The "trust the plan" idea worm is insidious and damaging to some of the people who are most potentially helpful in the war against the Deep State." I am old as dirt and I would love for a shining prince come riding in to save my country but because I am old as dirt the reality is it is not going to happen. Do I love that this "Q" is waking folks up? Yes! But as you I also see the bait being dangled and my greatest fear is folks will willingly allow and welcome the FEMA camp Military martial law that is coming. Freedom of speech is the double edged sword swinging at all our throats and it is what we all have to guard against losing... I may not like what someone says but will defend their rights to be able to speak.
" I would love for a shining prince come riding in to save my country but because I am old as dirt the reality is it is not going to happen." I think the really awful part of this is what I see as conscious manipulation of that exact hope and all the disappointed hopes before it. I agree and understand why the hopes and prayers are in this, to much, to many years of being the serfs under them all. So many have forgotten how to be human and not be out to destroy or control others. All we can do is keep speaking and getting the message out..
it's great to see so many report & inform about this. once the reader is familiar with psyops, they always seem obvious & clumsy, but one has to get there thanks to articles like this; so thank you, and never stop! hello to everyone, from Russia. I'm new here, please tell me how to do everything right here. And yet, you forgive me for my English, I do not know him well and therefore I use translators.